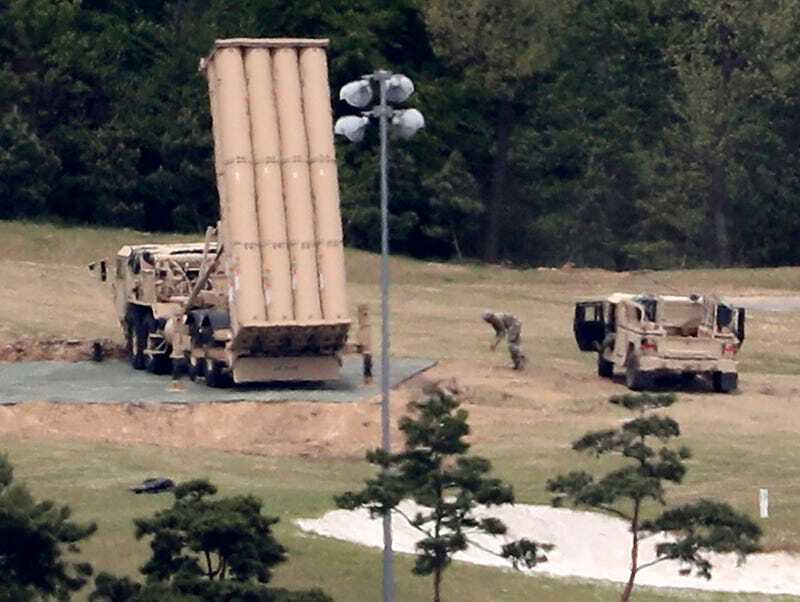 Chinese officials have long protested the U.S. deployment of the Terminal High-Altitude Area Defense (THAAD) missile defense system to South Korea because they believe it can spy on its military activities deep inside its mainland. Well, on Tuesday, Beijing’s fears were pretty much confirmed when military officials in South Korea reported that they were in fact able to detect North Korea’s recent ballistic missile test Sunday with THAAD. Reuters reports that South Korean officials were able to determine that the missile was an IRBM (intermediate range ballistic missile), which can travel between 1,860 to 2,485 miles. The country’s defense minister, Han Min-koo, added that the North’s missile program is developing faster than expected. While we are not sure how, exactly, the South used THAAD to track the north’s missile test, the accompanying X-band AN/TPY-2 radar may have played a role. To recap, THAAD uses powerful radar systems to track short, medium, and intermediate-range ballistic missiles similar to the ones North Korea could use in a hypothetical a nuclear shooting match. THAAD then uses non-warhead equipped missiles to destroy the enemy projectile. To be sure, China is not worried about THAAD’s missiles; again, they are not armed with warheads, so they are not offensive weapons. What’s really at issue here is the radar. Second, while we have no watertight estimates on just how capable the AN/TPY-2 radar is and in what configurations, even the most generous estimates don’t leave the Gyeongsangbuk-do unit capable of any useful surveillance deep into the Gobi desert, where China has its most active and sensitive missile testing ranges. (AN/TPY-2 range estimates go from “several hundred miles” to 3,000 km.) I’ve mapped out the ranges below with the most generous range estimate of 3,000 km, using a Chinese ballistic missile impact range that Thomas Shugart at War on the Rocks recently revealed as a test-bed for potential People’s Liberation Army Rocket Force preempetive warfare tactics (i.e., a site of surveillance interest for the United States). There is an argument that THAAD could threaten China’s second-strike capabilities—its ability to respond in kind to a nuclear attack, and minimize its chances of being obliterated or crippled by an enemy’s first strike. What this comes down to is trust. Beijing doesn’t believe that the U.S. will use THAAD solely as a defensive measure against a North Korean missile attack. If the Chinese truly believe THAAD can track which of its missiles is carrying a warhead, it is a moot conversation to argue that it will not be used for that. The fact that THAAD can determine the success of North Korea’s latest ballistic missile test will not make China feel any more secure about it being deployed in South Korea. If it can be used to track Pyongyang’s actions, to what extent can it be used to do the same against Beijing? That is what has China up at night.